Best with ingredients fresh from the garden! 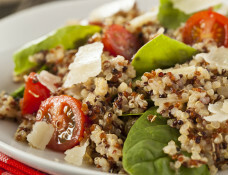 Pour in quinoa, raisins, and a pinch of salt. Cover, and let simmer for 12 to 15 minutes, then remove from heat, and allow to cool to room temperature. 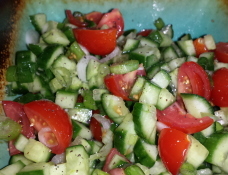 Toss together the tomatoes, onion, radish, cucumber, and almonds in a large bowl. 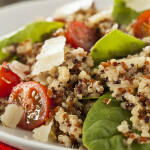 Stir in the cooled quinoa, then season with mint, parsley, cumin, lime juice, sesame oil, and salt. Chill 1 to 2 hours before serving. 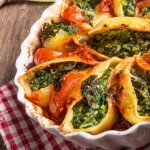 Spring officially begins in just days and if you're anything like me, you're ready to trade the rich, heavy foods of winter for lighter, fresher fare. We're in that in-between time of less available produce at the end of winter but before the lush abundance of high summer salad days. 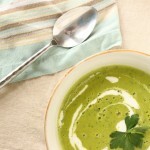 Enter lovely lighter soups made of verdant sweet peas, tender greens and fresh herbs; the holy trinity of early spring. Here's my take on a classic with suggestions to make it your own. Frozen peas are fine to use but good stock is a must. In a medium-sized stock pot, melt the butter over medium high heat. When butter foams, add onion and carrot, cooking until onion is translucent. Add the garlic and bay leaf and cook a minute or two longer, stirring occasionally. Add white wine, and continue cooking until most of the wine has cooked away. Add your vegetable or chicken stock and lemon juice and bring to a low simmer. You may need to adjust the heat. As soon as it reaches a simmer, add your green peas. Bring back to a low simmer and let cook until peas are bright green, about 7 minutes. Remove from heat and let cool slightly, about 10 minutes. Be careful not to overcook once you add your peas, or you'll end up with murky pond water soup instead of vibrant green soup! 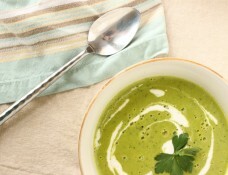 Carefully ladle or pour the soup into a blender along with the mint and parsley and puree until smooth. I like a really smooth pea soup but you may prefer it a little chunkier. Add salt and pepper to taste. If soup has cooled, you can rewarm it over low heat for a minute or two. **Here are some suggestions for garnishing your soup that will take it from simple to stellar. 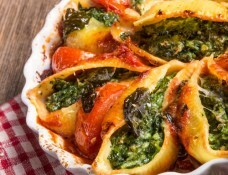 	16 jumbo pasta shells Cook a couple of extra shells to allow for a few breaking while the pasta cooks. Preheat the oven to 375 degrees. Cook the pasta al dente, according to package directions. Drain and set aside. Use more or less of these ingredients as you like. 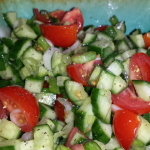 You can also cut vegetables in larger pieces if you desire or slice your cucumbers. Mix all ingredients well, chill and eat. Should be eaten in 1-2 days for best freshness.